My personal recommendation…. and an all time favourite. You simply cannot go wrong. It’s extremely easy to make and a guaranteed hit. Chocoholics – you might wanna save this somewhere. Aaaand vwala!!! 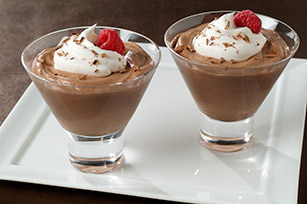 You have a signature mousse and will be loved by everyone who dares to devour your little creation. Decorate with whipped cream ooooor grated Peppermint Crisp or nuts… or just have as is. Warning: yes… it’s rather rich and addictive… so small doses people… relish in small doses. Super erxcited to make this!!! Yummmmmm!! And I can get all the ingredients here!